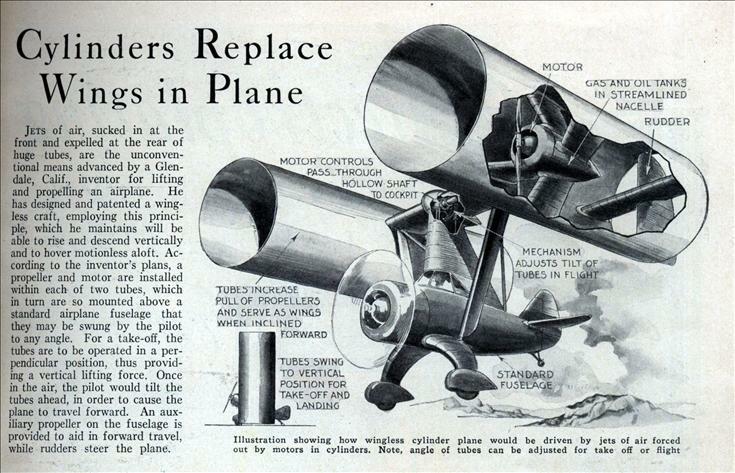 Jets of air, sucked in at the front and expelled at the rear of huge tubes, are the unconventional means advanced by a Glen-dale, Calif., inventor for lifting and propelling an airplane. He has designed and patented a wingless craft, employing this principle, which he maintains will be able to rise and descend vertically and to hover motionless aloft. According to the inventor’s plans, a propeller and motor are installed within each of two tubes, which in turn are so mounted above a standard airplane fuselage that they may be swung by the pilot to any angle. For a take-off, the tubes are to be operated in a perpendicular position, thus providing a vertical lifting force. Once in the air, the pilot would tilt the tubes ahead, in order to cause the plane to travel forward. An auxiliary propeller on the fuselage is provided to aid in forward travel, while rudders steer the plane. This design appears to depend on sufficient upward thrust to support the aircraft. Not a chance, except with a rocket. @ Rick Auricchio – Yea, I just don’t get how this is supposed to fly. A duct fan concept?? I can not image the size of the tubes? Did they just print any design that showed up in the mail? You have to assume the two ducted engines can produce enough thrust to overcome the weight of the aircraft, and were somehow controllable enough to survive near the ground for multiple seconds. Once airborne, throttle up the forward engine, tilt the ducts, and start forward. Eventually, you get aerodynamic lift off the ducts when their angle of attack is just right. Whether that lift is a significant portion of your weight is the big “IF.” It’s not a huge area as shown here. but even that wasn’t very successful. The first prototype crashed, and it never reached its modest target speed. 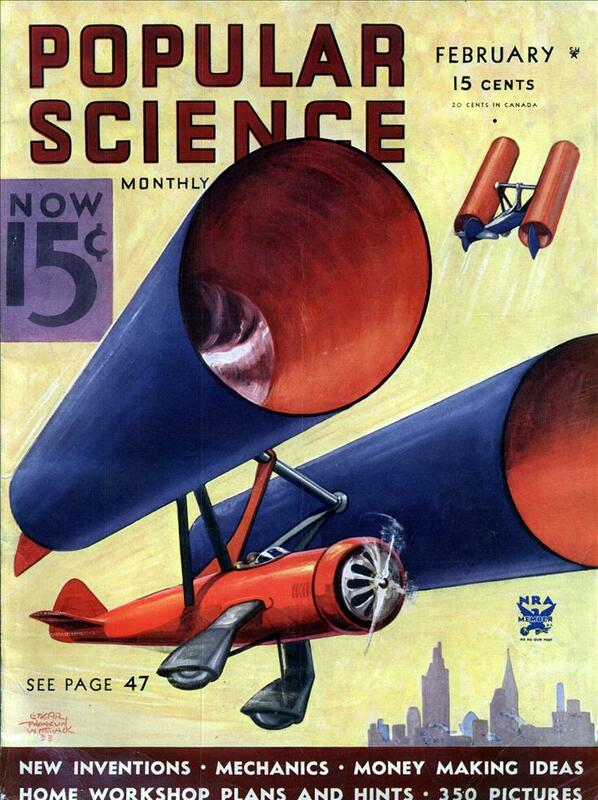 I think they may have been extrapolating this idea from the design of the Stip-Caproni.